Want to know what it takes to make the news? 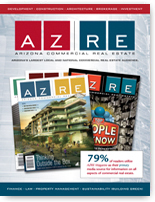 Find out what AZRE | Arizona Commercial Real Estate Magazine is looking for from the architecture community. Come and meet Associate Editor Peter Madrid from AZ|RE Magazine! He will share what the publication is looking for, the submission process and answer any questions that you may have. PLACE: AIA Arizona (30 N. 3rd Avenue, Ste. 200, Phoenix, AZ 85003). If you have any questions about this event, please email Alexandra Evjen.